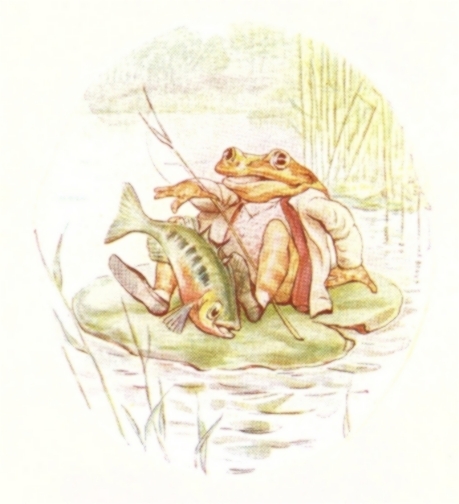 Enjoy this Beatrix Potter story in our collection of Foodie Stories for Kids. FOR STEPHANIE FROM COUSIN B.
MR. JEREMY stuck his pole into the mud and fastened his boat to it. HE punted back again amongst the water- plants, and took some lunch out of his basket. A GREAT big enormous trout came up—ker- pflop-p-p-p! with a splash— and it seized Mr. Jeremy with a snap, "Ow! Ow! Ow! "— and then it turned and dived down to the bottom of the pond! BUT the trout was so displeased with the taste of the macintosh, that in less than half a minute it spat him out again; and the only thing it swallowed was Mr. Jeremy's goloshes. 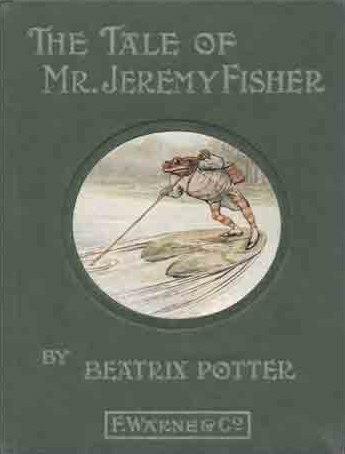 Add The Tale of Mr. Jeremy Fisher to your own personal library.